This Saturday, 29th November, is the sixty-first anniversary of the darkest day in the history of the then still youthful United Nations. The Organisation then member states carelessly breached the provisions of the Charter by voting in favour of a partition of Palestine without any attempt at asking the population what it wished to have as a future, after the British Empire wished to give up its mandate due to a general desire on the part of the government headed by Clement Atlee to decolonise, cut expenses and end the terrorism of the Zionist gangs, Irgun Zwai Leumi, the Strern Gang and Haganah. The British Empire had been bled dry by the cost incurred for the supply of very expensive arms from the USA manufacturers before their country finally joined in the Second World War half-way through. Also the cost in British lives and injuries at the hands of the terrorists was a strong argument in favour of leaving what had become a hell-hole not only for the indigenous people but also for the British before, during and after the War, as a result of the attrocities committed by these de facto allies of the Nazis. 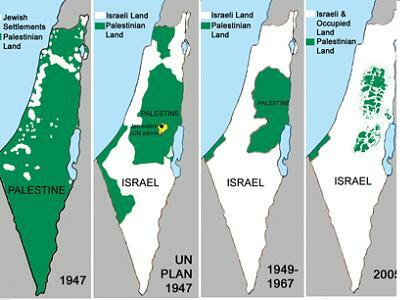 For those who do not understand the extent of the injustice of the Proposition for which the United Nations then voted, the Zionist occupied land in Palestine was approximately 7% and that occupied by indigenous Palestinians some 93%, whereas, apart from the proposal to make Jerusalem and its immediate neighbourhood into an international area, the land was attributed almost equally between the indigenous people and the incoming Zionists, with the latter being given areas largely occupied by the former, especially in the centre and in the south, including the Naqab (or in Hebrew Negev) giving access to the Gulf of Aqaba. We should all condemn this terrible breach of justice, as well as of their Charter, by the United Nations and work towards the establishment in all of Palestine of a single democratic state, where all those driven out by force in 1947-1948 (and their descendants) can, as the United Nations did later resolve, return and recover their homes and lands, and where full citizenship rights do not depend on one’s belonging to any specific religious group.